I don’t think I could have been more delighted and inspired by this evening’s Edible Education 101 lecture. 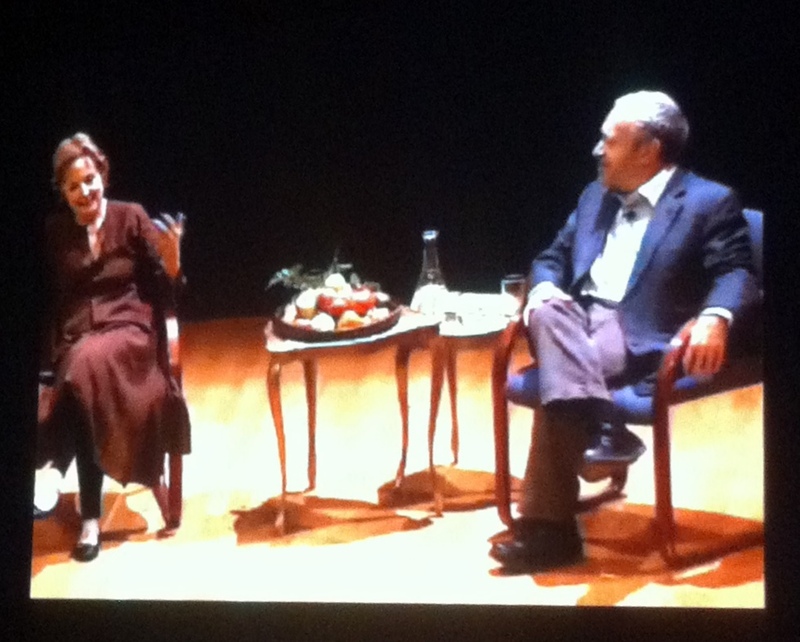 Watching Alice Waters paint a vision of a future in which kids live in a world of good food is the perfect anecdote to a crazy can’t-stop-to-breathe typical Tuesday at the GSB. Former Secretary of Labor and current UC Berkeley Professor of Public Policy Robert Reich did an exceptional job of drawing out Alice’s story, which I’d never before heard her share, and playing devil’s advocate to the sometimes idealistic future she envisions. Robert named Alice as perhaps “the only 1960s revolutionary who actually succeeded” and asked her what got her started, over forty years ago, as a proponent of organic, slow food. She described her time studying abroad in France and savoring both the local food and the strong culture around food. She came back to the US and realized, “I wanted to eat like that; I wanted to live like that.” After graduating from Cal in 1967, she spent a few years traveling and then returned to Berkeley to open Chez Panisse in 1971, forty years ago. Her story resonated with me much more than I expected as I usually cite my year abroad in Bologna, Italy as the spark that set off my passion for healthy food, sustainable agriculture, and food system reform. After operating the restaurant for 25 years, Alice began a project with Martin Luther King Middle School in Berkeley to plant a garden. She had always believed that information comes into the mind via the senses: sight, sound, smell, touch, and taste, and she thought about how a garden could appeal to every sense. She had an “ah-hah” moment when the vision of an Edible Education clicked: it would not be a catering program or an extracurricular activity but an integral part of the academics at the middle school. She founded the Edible Schoolyard, a highly-acclaimed program which has thrived over the past 15 years. In response to a question about the costs of the program, Alice responded, “I believe it’s immoral to feed kids in schools foods that aren’t good for them.” Such an obvious statement but it amazes me that it even has to be said. How is it that we even have to defend this position? When pushed harder on the cost question, both by Robert and instructor Nikki Henderson, Alice made the analogy to the physical education campaign advanced by President Kennedy in the early 1960s. State governments rose to the challenge of finding the money. P.E. is such an integral part of our childhoods that it’s hard to imagine school without it. Ideally, E.E. (edible education) can become just as integral to the experiences of future generations. Alice talked about the NPV of edible ed: invest now and save tremendous costs on the back-end. And finally Robert addressed the massive amount of “corporate welfare” dollars (which he estimated as ~$100B per year) as a source for supercommittee budget cuts that could also push our food system in the right direction by diminishing distorting food subsidies. One last quote that I loved: Alice mentioned a bumper sticker she’s seen, “If we are what we eat, then I’m fast, cheap and easy.” “We can laugh at this,” Alice said, “but it’s not funny. The things that give us the most pleasure in life are things that take time—getting to know someone knew or watching a sunset. I believe deep down we all long to go back to a place where we feel connected to a rhythm of nature.” Well put, Alice. Thanks for an inspiring evening! This entry was posted in Uncategorized and tagged Childhood Obesity, Edible Education, Event, Event recap. Bookmark the permalink.